During my school vacations, in the afternoons when my grandmother used to take her nap, I would tip toe and quietly sneak into her kitchen and gobble up these laddus. In the evening, when I asked her for more and she opened the lid of her traditional brass boxes, she would look at me with a knowing smile and admonish me saying ‘too many peanuts are not good for you, they will increase your pitta (heat in the body according to Ayurveda)’. These constant sermons of pitta getting imbalanced did not stop me from devouring these delicious sweets. And my digestive fires were strong enough to take in as many as I wished! Years have passed since, and my fascination with these laddus continues the same way, the difference being that I now make them myself and I do need to exercise a certain amount of control for fear of over-indulgence (which most often than not proves to be a futile exercise). When you are looking for something to satisfy that sweet tooth and give you a quick burst of energy, these peanut balls are sure to satiate that craving. They are super-easy to assemble, require practically no cooking and are so simple to make. The wholesome goodness of jaggery and protein rich peanuts pack in quite a powerful punch! Make sure you use unbleached, unrefined and preferably organic jaggery to make these laddus. 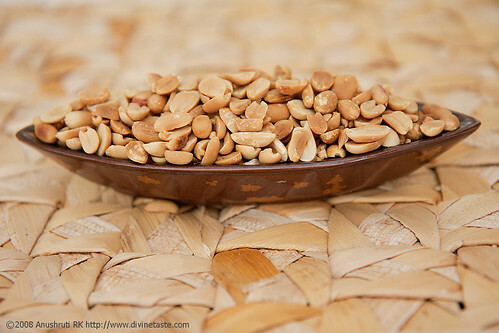 Grind the whole, roasted, unsalted peanuts without skin in a food processor. Work in short pulses and give the peanuts a few seconds to cool between each pulse or else you’ll end up with a sticky mass. Pulverize the jaggery with a mortar and pestle or with a metal potato masher. Assemble the powdered peanuts and jaggery in a bowl and with the help of a potato masher or with the help of a mortar and pestle, mix the powdered peanuts, cardamom powder and jaggery. Alternately, after the peanuts are powdered, put in the jaggery into the blender/mixer and blend until mixed and then form into laddus. * If you like your laddus to be on the sweeter side and if you love jaggery, use 1 cup of jaggery. 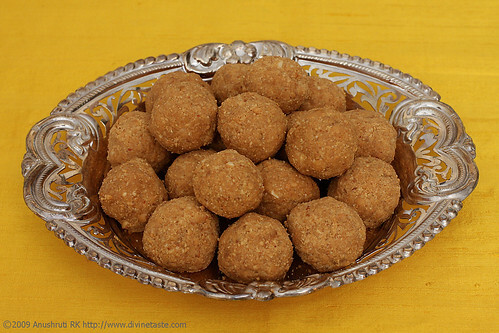 3/4th cup jaggery will give laddus that are moderately sweet. Peanut butter is one of my favorite things so these sound great. I've never used jaggery. Do you think it would be difficult to find in the US? Hi Sara.. Jaggery has a very earthy taste which perfectly complements the roasted peanuts. You wouldnt find it difficult to locate in an Indian grocery store in the US. 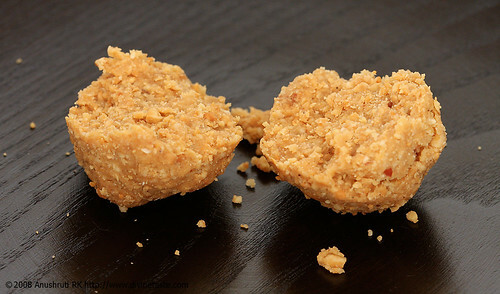 It's like a chikki made with jaggery in bengal, but peanut halves are used. Love it! Soma: True. Quite similar but different in taste and texture. Peanut/groundnut chikkis are made in Maharashtra, Gujarat and Karnataka too. Nee madhidh nodi balla santhosh aithu. Nee kasht pattidhaku saarthaka aithu. Innu balla mundh waribeku. Niim Ajja idhidhre yeshtu khushi padthidhru. Idake rohit nu prothsaha kotidane., baaki yella cholo aagli antha nanna aashirvada. Inu yen andhre, laptop dhage thilas beku antha nanige gothirlilla, rekha helidlu. Nee hinge mellake khanditha hoguthia antha nanna bharavase. website balla chandha agidhe. My mom uses a slightly different technique though. She melts the jaggery first, adds a bit of dry ginger powder and cardamom along with the crushed peanuts and quickly forms the laddus. I tried this at home once but ended up with severe burns on my hands. Ria: These are a hit always! I'm so delighted you enjoyed them. Hey Anushruti, this is really nice and easy,I have to try it out soon. Happy Janamashtami to you and your family! Wow.. your ajji's words are so inspiring & touching! I am sure her blessings will take you a long way.. Keep up the good work! Happy Janmashtami! Hey Anu once again thanks for awesome recipes I made peanut ladoo,cocunut n semolina ladoo,seven cup burfi and anjeer burfi and all turned out perfect thanks a ton for mkng diwali special with such fab and quick recipes looking fwd for more new post happy diwali. ruchika: That's awesome! You seem to be gifted and to have a great sense of cooking. Hi Anushruti…I tried this recipe last night and the laddus turned out awesome! I used to make them by melting the jaggery in the ghee and then adding the crushed peanuts. But, this one's a winner! Love your blog! I tried this recipi in small scale, came nice. How long the laddoos can be kept safely and used since raw jaggery is used here? Dr. Prabhakar: These laddus keep well for 2 to 3 weeks, stored in an air tight container. This recipe can also be done with sesame (til) seeds in winter instead of the regular til ladoos. Loganayaki- I'm happy to hear this. Glad you liked this recipe Jayashree. I love it too.